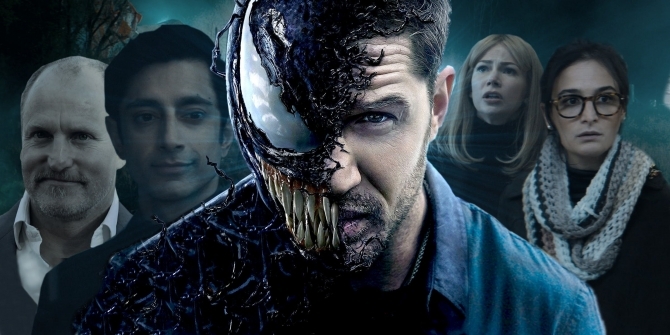 During the subsequent twenty four hour period after its official release, the theatrical trailer for Sony Pictures’ Venom has surpassed both Wonder Woman and Doctor Strange in total number of views. As reported by The Wrap, the theatrical trailer for the Ruben Fleischer-directed Spider-Man spinoff, which debuted at Sony Pictures’ CinemaCon presentation on Monday, garnered more than 64 million views within the first day. The video’s current view count sits at 124.7 million. The figure in question can likely be attributed to the long-awaited reveal of star Tom Hardy encased in the sinister symbiote. Following a disappointing teaser and rumours that Fleischer’s film wouldn’t showcase much of Eddie Brock in Venom form, Sony Pictures responded, giving fans exactly what they wanted and now, the studio’s reaping the benefits. According to the social media tracking website Fizziology, the second Venom trailer is a rarity. The 64 million views plus amassed in its first twenty four hours was an increase of 72 percent over the first preview, while positive social conversation was up 46 percent, and negative social talk was down 63 percent. These stats are most comparable to Marvel Cinematic Universe entries Spider-Man: Homecoming and Ant-Man. Slated to hit theatres on October 5th later this year, plot details for Venom are scarce at the moment. We know journalist Eddie Brock will bond with a symbiotic alien and struggle to control his alter ego, but that’s about it. Still, we’re very intrigued to learn more, especially after watching that new trailer, and we’ll be sure to keep you right up to date as further details surface. Directed by Ruben Fleischer (Zombieland), Sony Pictures’ Venom stars Tom Hardy as Eddie Brock/Venom, Michelle Williams as Anne Weying, Riz Ahmed as Dr. Carlton Drake and Woody Harrelson in an unknown role – Carnage, perhaps?